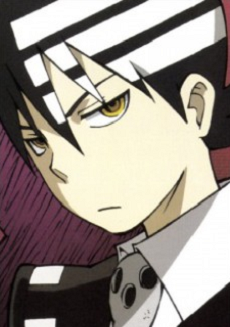 He is Patty and Liz’s technician and the Shinigami’s son. He is called Kid by his friends and family. At first glance, he seems to be perfect in every aspect (polite, well pressed clothes, etc.) But he has one major flaw: he is completely obsessed about everything being symmetrical and takes the idea of perfection to the extremes. To him, anything symmetrical is beautiful and if it’s off by any measurement (a picture frame off by millimeter, or a pose that is slightly out of place), he will try to correct it right away. The biggest problem Kid has with is his hair one side being completely black while the other has three white strips going across it. Showing Kid anything that is too unsymmetrical or mentioning his hair will send him into a state of massive depression (which normally takes encouragement from Patty and Liz to break). He refers to Shinigami as Chichi-Ue (Honorable Father). His father has mentioned that Kid is already a shinigami and doesn’t need to collect souls but Kid says he wants to make a weapon of his own. His father also says that since he uses two weapons (the guns don’t count as a set), he will have to collect twice as many souls (198 Eggs of Kishin (Corrupted Souls) and 2 witch souls). If he sees anything perfect or symmetrical get broken or destroyed, it will send him into a blind rage where he will unload all of his power to erase the offensive sight from his eyes. He has a flight-capable skateboard called Beelzebub, which he uses as a form of short distance transportation.